An enchanted hymn, an art, devoted to the liberty and freedom of women. 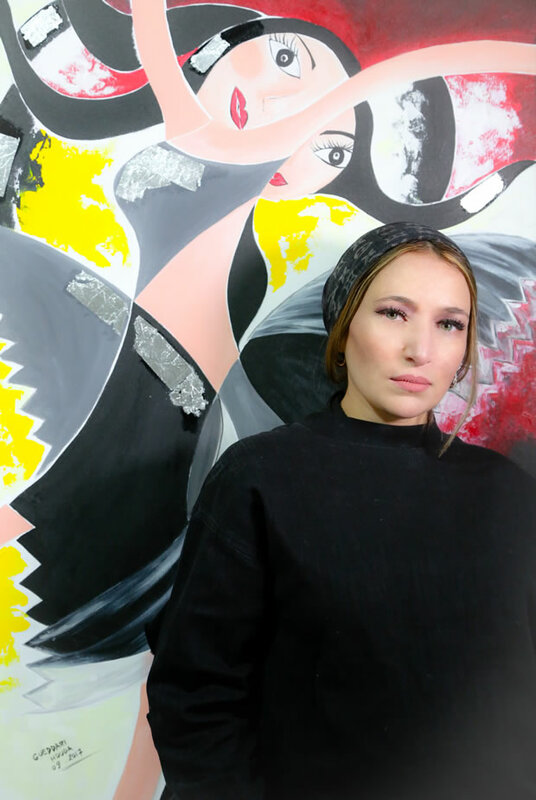 Houda got her passion of painting from her father at a young age. She does not paint the unessential and the gratuitous. Her paintings draw tales and stories that are mainly inspired by the divine memory of the terroir with glittering colors and a cohort of signs that breathe, sing, dance, and celebrate freely from any traditional fertile reflexes. A rhetoric of the body is pervasive. Body of flourishing and thriving modern women, provoking the traditionalism surrounding and shaking up the reifying and egotistical power of man. Because of this, she uses a special language that draws from heritage, in the inhibited collective memory, an idea that flows from source; a palette of vivacious colors, intersected by light, golden sparkles. Only the aggressiveness of rectilinear lines can break the light tones that contain sad touches. Sometimes dark, shouting the unspoken, the thirst, the pain, the anger to live freely, betray a natural painting. Houda’s plastic language is vigorous that rationally combines the reliefs of thought like romantic poetry or soft music. She puts the receiver, her personality, her feelings, her faiths to the test. Well-known ideas and aspects linked with media and modern materials punctuate her paintings and betray* her traditional impulse and her anchoring in modernism. A pure blend of innocent figurative, cubism that does not say its name, concealed surrealism, delicate and lyrical international calligraphy, all with polished touches, and movement, always moving away; this is called a natural art-enriched tripe: it is all the art of Houda GUEDDARI who gives her art her everything; her body, her soul, her life. Houda is the ambassador of Morocco in Dubai. Her art is appreciated worldwide as she was ranked amongst the first at the global art awards. She is also chosen from 50,000 worldwide candidates to receive the prestigious Leonardo da Vinci International Art Award that will take place at Borghese Palace in Florence, on 20th January 2018. Her contemporary art and trend continues to surprise.